I’ve been into cooking and eating pork for dinner lately, partially due to my boyfriend’s recent cutback on beef intake, but mainly because of its robust flavor. I’ve been so consumed with steak that I’ve forgotten how flavorful and delicious wonderfully prepared pork can be. I hear so many contradicting stories about pork in the media (one claiming that it’s the “other white meat” and other claiming that it’s the worst animal flesh to ever enter human bodies) and I truly don’t know what to make of it. But I believe in variety so I will have an occasional piggies with a nice glass of white wine, with no apologies! I am also a believer that all food are good, in moderation (unless they’re processed, then they’re no longer food, of course) so bring on the deliciousness that is pork! I like my pork cooked simple. I like it seasoned with salt and lots of black pepper, grilled with a little olive oil, and enjoy the juicy flavor of the meat in its purest form. 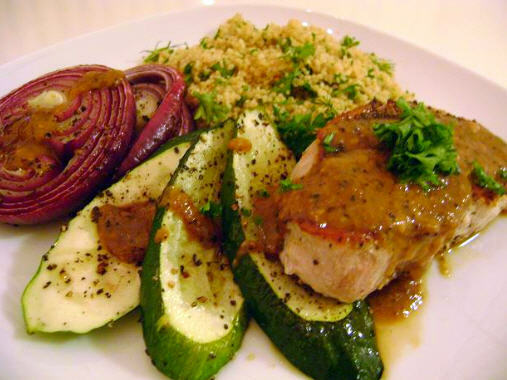 Accompanied with whole-wheat couscous, grilled red onion and zucchini, and drizzled with Dijon mustard deglaze sauce, it’s a world-class dish at a comfort of your own home!